You either love it or hate it. There's no middle ground when it comes to knitted ties, you know, those sock looking things people use as ties. This tie can be worn all year round but the reason it is a great accessory during the fall/winter season is because it adds more texture and character to the already textured clothing we wear in that season. Dating back to the early 1920s, knitted ties has been a staple in every sartorialist's closest but it has also been met with disdain in the modern age. If you're not into knitted ties, then this post isn't for you but if you love them or want to try them out for the first time here are four things to look for when purchasing one. STAY. AWAY. FROM. POLYESTER. Polyester is one of those fabrics that is an abomination in the menswear world. Not only is it man made from harmful chemicals, it just looks and feels keep. Stick to natural fibers like cotton, linen, silk that feel good and would make a pretty sturdier knot than polyester. Choose quality every time. Speaking of knots, you are very limited on this front. Knitted ties are just thick as you hold them so tying them in a knot just makes it a little to0 thick. So with a wool and cotton knitted tie, my preference is a four in hand knot and for the silk knitted ties I go for my favorite knot, the double four in hand also known as The Prince Albert knot. A general rule is you need to have the right collar spread to host a the right tie knot for example, a spread or cutaway collar is best for when you want to tie a full windsor knot. 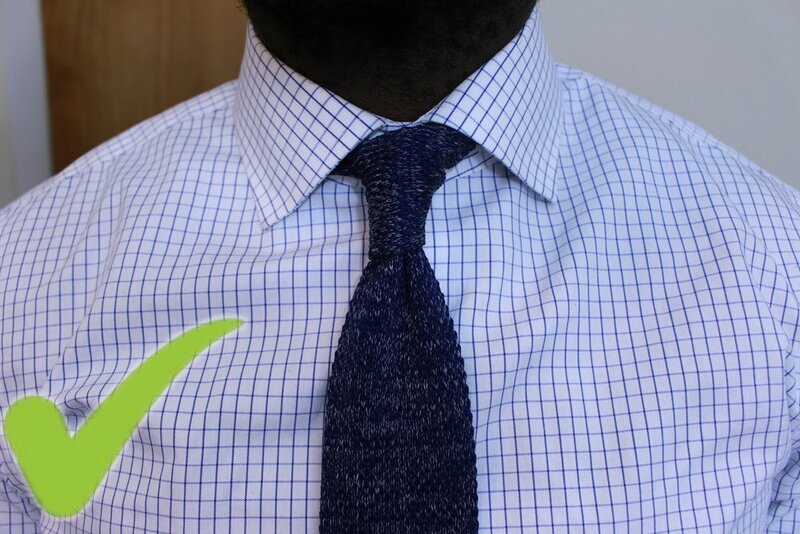 As mentioned before you are limited to the types of knots you can make with a knitted tie so the most common narrow spread will work well with that. 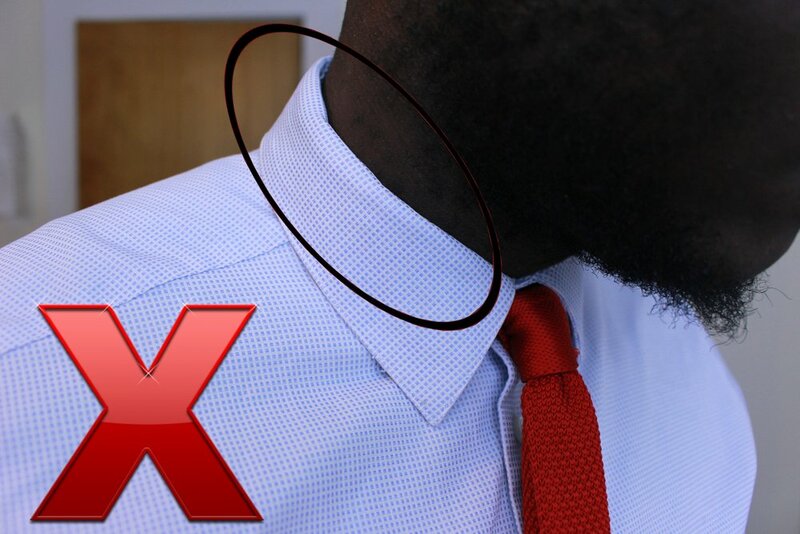 What I'm trying to get at is the actual size of the overall collar to host the tie when you wrap it around your neck.Because of the thickness of the tie, you're going to need a nice sturdy collar, not a flimsy one. Using the latter will make the collar look obviously uneven. The shirts I used that worked well with thw knitted tie measured at a little over 2 inches in the front and a little over 1 inch in the back. See below. Originally, the knitted tie was for more casual clothing thanks to the flat squared bottom of the blade and the tail. Companies such as The Dark Knot sell the knitted ties with the classic pointed bottom. Over time the knitted tie has been worn from casual to formal, even though I wouldn't recommend it for a black tie affair, it can definitely be worn with a suit nowadays. If you chose to rock a knitted tie, be prepared for the weird looks and the "is that a sock?" comments but also be prepared to stand apart from the crowd in a good way. When I see a man pair a knitted tie with with some textured garment in the fall/winter, I know nod my head in acknowledgement. He knows what he is doing. The knitted tie is here to stay so come over to the dark side and wear one with sartorial splendor.